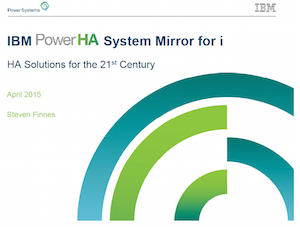 PowerHA SystemMirror for IBM i dramatically advances high availability and disaster recovery, maintaining perfectly mirrored data replication at all times. PowerHA SystemMirror for IBM i (i Series, AS/400) systems represents a leading high availability disaster recovery software solution that utilizes storage based data clustering for customers that need an alternative to logical replication. By leveraging the use of IBM storage servers, PowerHA drastically improves your recovery response time through disk-to-disk data replication. Featuring synchronous storage replication, PowerHA maintains perfectly mirrored data replication at all times and, thus, provides zero-age recovery point objectives (RPO) for all data. In addition, it eliminates DS8 K storage outages (planned or unplanned) because of its HyperSwap functionality. Easy to use and economical, PowerHA brings your business up to speed with the most modern DR technology available. 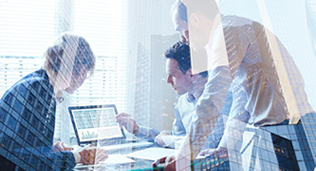 The Express Edition for IBM i 7.2 enables you to restart your LPAR into another LPAR located on a different server, streamlining your HA procedures. With the Express Edition, PowerHA restarts your principle LPAR or IPLd and targets another LPAR on another server. This differs from the Standard Edition which, instead, places the database into an IASP separate from SYSBAS. Express is a great option to keep your data continuously available. Consistent monitoring, data failure detection, and automated recovery are the hallmarks of the PowerHA Standard Edition. It takes advantage of IBM’s entire collection of disk storage solutions. With functionality to constantly track both soft and hard data errors, from virtually any process source, you can rest assured your data is safe and ready for expedited recovery when needed. The Standard Edition is supports numerous families of storage servers, including V3000, V5000, V7000, SVC, Storwize, and DS800 with LUN level switching. 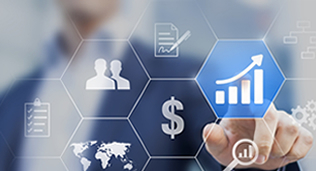 Enterprise Edition adds greatly to the functionality offered in the Standard edition and is IBM’s most robust PowerHA edition. With Enterprise, you can integrate your data solutions across two sites and include geographic mirroring, which allows you to implement a geographically-dispersed, two node Power HA SystemMirror cluster with either internal or external data disks. This feature can significantly lower costs associated with disk ownership and operational management. Specifically designed to protect businesses from downtime across an entire geographically distributed enterprise, business data is mirrored from multiple locations and any node on the network can automatically failover to another location of your choice. Although named “Enterprise,” this solution is suitable for any size organization that has decentralization of data.